Monosapiens are Rik & Simon Arbuthnot, they started in 2001. Between them they play guitar, bass, drums, percussion, keyboards, samplers, and whatever else they can find lying around to make a noise with! Their past notable releases include 'Hotblack EP' 12" vinyl 2001, 'Bad Robots LP' CD (2004), 'The Conspiracy LP' CD (2007), 'Labyrinth EP' 2013. The band now bring you the Frequency' LP with rapper Conscious Route bringing a mix of Soul, Funk, Jazz, Hip-Hop and various other influences which are blended with organic instrumentation fused with samples. The LP features long-time collaborator Chris Greive, aka Soundbone, on trombone and organ, and Jon Thompson, who also plays bass in the live band. The LP also features Edinburgh-based United Front MC/Producer, Sean El, and cuts on ‘Meteor Shower’ by DJ Sokol from Paraletic Universe, who is also Edinburgh based. 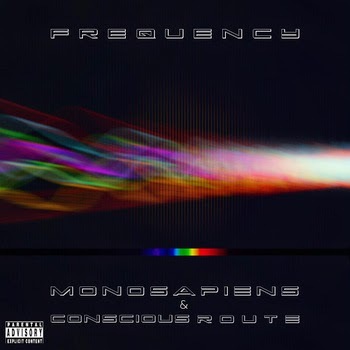 Conscious Route is the front man for this project, originally from England (between Cambridge and London), he started out Mossman Skank, later abbreviating his name to Mosman. He is a founder member of now dispersed hip hop crew Fugaizrum, who later became a cross-over Hip Hop and Blues band. He started to write hip hop in 1998, being influenced by names like Talib Kweli, Pharoahe Monch, Wu Tang Clan, Roots Manuva, Black Twang, Task Force, Terra Firma, Triple Darkness, Dr John, Eek-A-Mouse, Michael Franti, and Bob Dylan, which in turn all shaped his flow and sound on this diverse sounding album.